My parents were members of this church congregation from the early 1930s onward. They were Louie Smythe and Frank Fry, in the centre of the front row of this photograph, which I think was taken at an outing about 1932. I believe Mr Waldron is the distinguished looking gentleman in the high collar at the right-hand end of the middle row. Does anyone recognise the rest of the people in the photo? If you recognise or can identify anyone, please leave a comment below. I remember Mr and Mrs Waldron very well they were my Sunday School teachers at the Mission they were well liked. Mr Waldron showed the Magic Lantern afternoons as a special treat and we had great singalongs and Mrs Waldron played the organ and there was foot pedals that you were allowed to push sometimes if you remembered the books of the Bible. We had great parties and as I remember trips out too. You always took your own cup and plate. That was about 1946 onwards. Mr Waldron was an incredibly long lived man! The photo is 1932 but he officiated at my wedding at the Mission in September 1972! He was always immaculately turned out, a proper dapper gent! Stumbled across these comments. I have been fascinated about the Mission as my great grandparents were teachers there back in 1898! I have a bible awarded to Louisa Parris my great grandmother in 1898 on becoming a teacher. My great grandfather Arthur Smith played the organ. Louisa Smith nee Parris lived at 48 Bentham Road latterly with my late grandmother and mother Gladys and Joan nee Morris, later MacRae. I was brought up at the Mission from birth – in 1956 – until leaving home in the mid-seventies and my parents were married there. This is too early for them to appear – Dad would have been a toddler at the time! But I recognise Miss Linda Green – sitting on the ground and second from left. Also, Earnest Waldron is the dapper, younger man on the left of the picture, not the “Victorian” gentleman. Ernie Waldron had started working life as an engine driver at Brighton, but became a leading light of the Brighton and Hove Town Mission. The existence of a “mission” church is indicative of Edwardian moral panics surrounding the godlessness of Brighton’s backstreet population and this still provided an undertow to mission’s work during the sixties, with drink and the area’s plentiful pubs a target for rebuke! I remember Mr and Mrs Waldron from my childhood attendance at Islingword Road Mission. My friend and I always used to call at their home in Freshfield Road for them on a Sunday afternoon, prior to going to Sunday School. We were always invited to help ourselves to (very ripe) apples from the summer house in their garden. Mrs Waldron was touchingly naive at times when giving us Bible lectures. She said that the wine referred to when Jesus turned water into wine was ‘just pure juice squashed from the grapes, that’s all it was. I expect Jesus drank some of that!’ However, they were happy childhood memories, and instilled in me a love of literature when I was presented with a copy of H E Bates stories for 1st class attendance at Junior Church. I also attended the Cubs and Scouts at the Mission. My friends and I could hardly wait to get there on a Wednesday evening. My Mum, Peggy David nee Elliott, also went to Islingwood Road Mission and Mr Waldren married my mum and dad. I also went there as a child when we visited my grandparents who lived nearby in Quebec Street. I also remember Mr and Mrs Waldron. My parents were both members of the church – Denis and Marina Colwell. My brothers, Andrew, Jonathan and David, my sister Lesley and myself all attended Christian Endeavour on a Thursday evening and Sunday School there. If you remember us please get in touch. The Victorian high collared gentleman is my uncle, Herbert Groves – superintendent for over 50 years. Next to him is, I think, my father, Henry Wilkins, who often preached at the hall where he met my mother Alice Gammage. Have just seen this site which brought back many memories when I was a boy. From 1940/50 I lived next door (87) to the Mission. For some years my mother (Gladys) was the caretaker. I can recall most of the names mentioned and can add a few more such as Tom Fry, Cliff Mills (Scout Leader) Fred Farley, Vic Moss, Betty and Eileen Elliott?, Madeline Collier, Ken Maynard, Les West, Stan Colwell, Bill Hargreaves to name but a few. I often had to ‘pump’ the organ on a Sunday – hard work! Should Debbie Fox read this and is related to the Elliotts mentioned (lived in Pankhurst Ave and or Quebec St) I can be contacted on – stanfordt33@ntlworld.com – should anyone wish to contact me. I lived in Whichelo Place, just around the corner from the mission, and our pre TV days were spent watching ,the MAGIC lantern shows at the mission, if I’m not mistaken we held cubs down stairs in the mission. This was in the mid forties. My life started very unhappily in the 1930s as a child with a physically abusive father, who was out of work, and with no money coming in. 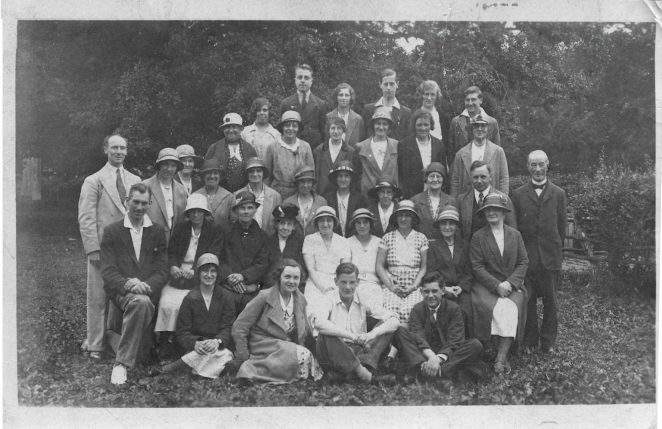 My Gran had attended Islingword Road Mission (IRM) in her younger days (we think she may be the little lady in the photo second row up, fourth from the right) and so, when I was 12 years old, I decided to attend her church with my younger brother. It was a long walk over the Race Hill to get to the Mission but I thought it would be good for us to get away from all the unhappiness at home. It was so lovely when we got there; everybody was so kind and gave us much needed love, which we had never received before. I will never forget the love and kindness we received there over the years. Crusaders was brilliant for the girls, and there was the Scouts for the boys. Exercise was encouraged, and we went up to the Race Hill regularly to play games. Mr Waldron’s house in Freshfield Road was where we did crafts, such as painting objects for presents. Thursday night was Christian Endeavour evening, which was a really happy occasion, and where we made many lovely friends. I met my husband, Fred, at the Mission and we were married there in 1952. My two little bridesmaids, Denise and Kay, were from the Sunday School class that I was taking at the time. It is so sad that Islingword Road Mission is no longer a place of worship. It taught me so much about family life that I have been able to apply as I brought up my own family. My children were dedicated by Mr Waldron and grew up in the Church, attending Sunday School, Junior Endeavour and the Girls Brigade. My sister Audrey and I attended Islingword Road Mission from 1937-1945. We used to go to Sunday school every Sunday afternoon and then the Church Service in the evening. The Sunday that the 1939-45 war was announced, we were playing in the garden – we lived near Queen’s Park) and after the first shock, we still went to Sunday school in the afternoon. I belonged to the YCU – I remember we did a play in the basement and we wore crepe paper costumes. We went to Burgess Hill every year on our trips and I still remember the thrill of the roundabout with the horses. I do remember too that our Minister always had a permanent nose drop, which fascinated us. We never saw him smile. Ernie Waldron was his second in command and really took on most of the practical running of the Mission. I knew Fred Farley well and my first boy friend was John Pollard. I could write a book on the experiences of those days and the impact of the Mission. During the war, it was our social life really. However, suffice to say that after school leaving age, most of us youngsters went our own way and then scattered all over the country. My name then was Joyce Peachey and my sister was Audrey Peachey. I would like to think that someone remembered us. We are of course in our eighties now with a lifetime behind us – The Air Force, Singing Training, Teaching, Headships for me and children, grandchildren and great grandchildren. I now live in Cornwall. For Audrey, Company Secretary, marriage, children and grandchildren and now lives in Lincolnshire. Best wishes to all of you from those days, Joyce (nee Peachey).